I’ve been enthused about language learning all my life, but my discovery of Benny Lewis and his multilingual abilities at his website fluentin3months.com has really inspired me to expand my fluency in several languages in 2014, something I plan to continue doing in 2015. One of the things he encourages those members of his community to do is to set out a plan on how they want to tackle a new language in the coming year. See his post on keeping a New Year’s Resolution with regards to learning a new language (or improving your fluency in one you already know). These tips are good for any goal, not just ones having to do with learning languages, by the way. 2. How to create specific and measurable language goals. One way to measure your specific fluency level is to use the Common European Framework of Reference for Languages. There are six fluency levels, with A1, A2 being the levels needed to survive in a country, B1, B2 being the levels needed to live in a country, and C1, C2 being the levels needed to thrive in a country. This framework has been influential worldwide because China’s proficiency exams have been changed to conform to this framework. A1 Beginner Can introduce oneself and understand familiar everyday expressions. A2 Elementary Can describe oneself and communicate about one’s immediate environment. B1 Intermediate Can talk about past and future events and about most situations encountered at work or school. B2 Upper Intermediate Can communicate about simple ideas and concepts in a way that is generally understood. C1 Advanced Can communicate about complex ideas and concepts in a way that is easily understood. C2 Fluent Can summarize complex idea and concepts and create coherent presentations. So when you start to learn a new language, your first goal should be to reach the “A1” level. Once you’ve achieved that, you can go on to A2, etc. The rough rule of thumb is that is takes twice as much time to go to each higher level than the one before. How much time it takes to go up any particular level depends on a) your consistency, b) the difficulty of the language, usually measured by how far it is on the linguistic “tree” of languages from your own (so Chinese takes three times as much time per level as Spanish for an English speaker). Last year around this time I put together a “multilingual plan for 2014.” Today I put forward my new plan for 2015. In the chart below, I list for each language what level of fluency I am at now, any recent achievements in that language, and then what my target level for 2015 is, together with any specific goals I have and what method I plan to use to reach those goals. With the fluency levels understood to be those referred to above, here’s my language planning chart for 2013. In the chart, RS means “Rosetta Stone”, DL means “Duolingo,” TB means “Textbook”, FSI means “Foreign Service Institute course.” The various abbreviations in the “Recent Achievements” and the “Plan for 2015” columns are for the officially recognized proficiency exams for that language. So essentially my plan is to move up one level of fluency in the five languages I’ve studied and am already proficient in (Spanish, French, German, Japanese, Chinese) as well as in the two languages I’ve studied on Duolingo and am still a beginner in but would like to improve to intermediate level (Italian, Portuguese). The four new languages I started in 2014 (Dutch, Danish, Irish, and Swedish) I intend to improve my fluency from beginner to elementary level. And finally, there are two languages I plan to start studying in 2015, Turkish and Korean. How do I study all these languages at the same time. I subscribe to the List app, which helps you create and maintain daily habits through the power of social media. This helps you create a consistent practice: even if you study for only 5 minutes every day, this is better than studying 30 minutes every week! Benny Lewis recommends Memrise, an app I plan to try out. I listen to foreign language recordings while driving, in particular my Chinese recordings from the FSI course. I listen to language recordings while doing housework. It takes away the drudgery of routine physical tasks by listening to foreign languages while doing it. You’ll reorder your brain while putting order into your environment, let’s put in that way. I use Duolingo for my European languages, which includes Spanish, French, German, Italian, Portuguese, Dutch, Danish, Irish, and Swedish. It is like Rosetta Stone lite, in that it helps you practice the four language skills of reading, writing, listening, and (to a lesser extent) speaking. It’s such a great app that I use it every day–I have a 468-day non-stop studying streak that I intend to stretch to 500 days. This Duolingo app is the core of my daily practice, and it takes about one hour. For a more difficult language like Arabic which is non-European, I use Rosetta Stone. Finally, the proof of language learning is in the speaking, and I plan to find incorporate the learning of foreign languages through Benny Lewis’ Conversation Partners and through professional teachers at Italki. These are some creative ways I try to use my time so that I can do something as audacious as to follow Benny Lewis’ lead, whom I mentioned at the beginning of the post. Last year I really stretched and added four new foreign languages to the eight I already knew (the five “core” languages plus the three I added on to it). There’s no reason why I can’t shoot for the same goal of being fluent (C2 level) at a dozen or more foreign languages. It is a journey of 1,000 miles, but I can do it–one step at a time for each language I’m studying! This year I read a biography of Ronald Reagan by Rick Perlstein called The Invisible Bridge: The Fall of Nixon and the Rise of Reagan. I was fascinated by the turn of events that caused Ronald Reagan as an inwardly-focused, shy boy to transform into the outward-going, charismatic individual he would be for the rest of his life. It was not an external event, but an internal one. He went to the library and started reading tales of heroes such as the “rags to riches” stories by Horatio Alger, and the Tarzan novels by Edgar Rice Burroughs. He decided that he would embody the hero’s journey that he had been reading about. It’s important in having a passion in life to recreate it from being the mere prosaic concatenation of events, the everyday version of what the historian Arnold Toynbee once called history as being described in dull textbooks as “one damned thing after another,” to being a hero’s journey or adventure. 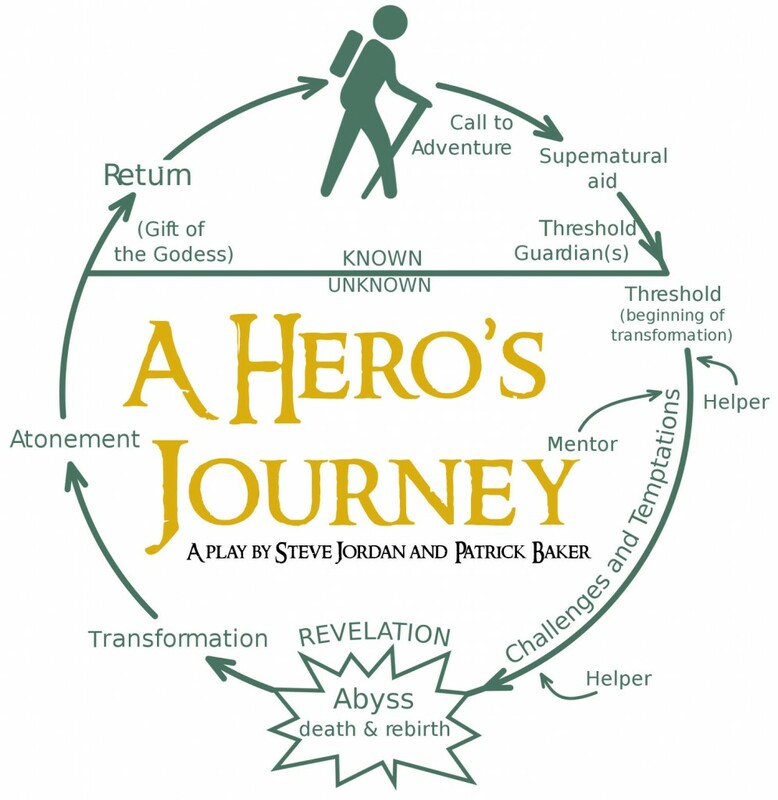 What is the Hero’s Journey? If you look at the illustration which I have borrowed from Jeff Salzman’s website The Daily Evolver, you can see that it has the following 10 elements, which I will illustrate using a modern myth that most people will recognize, that of Star Wars (the first trilogy). The hero is living a normal life, when he or she suddenly gets the call to adventure. In the case of Luke Skywalker, he is living a prosaic life of what is the future equivalent of being a farmhand, when he purchases two droids, C-3PO and R2-D2. R2-D2 goes off in search of Obi Wan Kenobi, a “retired” Jedi master. In following the droid R2-D2, Luke gets to meet Obi Wan Kenobi, who invites him to help him on his quest to save Princess Leia. Although Luke initially declines the invitation, his return to the farm brings the horrifying discovery that his aunt and uncle have been brutally murdered by agents of the Empire. He decides to go with Obi Wan and so they go to town to sell Luke’s speeder and to gain passage on a space ship that will take them to the Princess. The Mos Eisley Cantina, (a “space bar”) is the threshold between the “known” (the planet Tatooine) and the “unknown”. Here Luke sees people who have been out there in space, and has his first glimpse of aliens. The guardians are the beings at the interface between the known and the unknown which test the readiness of the hero to move forward. In the Star Wars saga, you could say that the aliens in the Cantina are the first test of the hero, because of them threatens Luke, who is rescued by Obi Wan Kenobi. Once they meet Han Solo, they leave the planet in the Millenium Falcon, which gets caught in the tractor beam of the Death Star. When Luke decides to risk his life to save that of Princess Leia, to whom he is inexplicably drawn, that is the first step on his journey to becoming a hero. Obviously, Obi Wan is the first mentor that appears to help Luke on his journey. But as Joseph Campbell pointed out in his analysis of the Star Wars saga in his conversations with Bill Moyers, Obi Wan not only gives Luke a physical instrument of power (the lightsabre), he gives him a new psychological center as he teaches him about the Force and how a Jedi must work with it as the source of his power. When Obi Wan sacrifices himself to allow Princess Leia, Hans Solo and Luke Skywalker (and the two droids) to leave on the Millenium Falcon, it is a temporary blow to Luke. However, at the key moment when Luke is approaching the Death Star with a missile aimed at an exhaust post, he hears the voice of Obi Wan encouraging him, and with that encouragement, he manages to blow up the Death Star. This is the end of the first movie. In the second movie, he gains training from a new, even more powerful Jedi Master named Yoda, and with the training, he goes of to confront Darth Vader. In the ensuing battle with Darth Vader, Luke has his hand cut off by Darth Vader’s lightsabre, and in the ensuing conversation with Luke, Darth does not kill Luke but invites him to join him and fight the emperor, and rule the Empire in his stead … as father and son! Luke at first refuses to believe he his Darth Vader’s son, but after he escapes, he realizes it. When I saw this in the theater for the first time, my shock was almost as great as that of Luke. I thought this was simply going to be a Disney-like good vs. evil story, but it gained a level of intensity when I found that in this story, good was related to evil. In a key scene at the end of second movie, he is given a prosthetic arm and it is clear that he is wondering if he himself is becoming part machine, like his father. He decides that he must fight on the side of the good, even if it means doing the unthinkable, namely, killing his father. This is the end of the third movie. In order to get guidance from Yoda before the final battle, he returns to Yoda’s planet only to find that Yoda is dying. Before his death, Yoda reveals that he has a twin sister from whom he was separated at birth … namely, the very Princess Leia whom he saved in the first movie! Luke’s atonement is the killing of his father, or symbolically killing off the evil within himself. During the very enervating battle, Darth Vader reads Luke’s mind and suddenly realizes that Luke has a twin sister. Luke’s wanting to protect his sister from harm finally gives him the strength to subdue his father. At this crucial moment, the Emperor comes to Luke’s side, and asks him to kill his father and take his father’s place at his side. Luke refuses, throws away his weapon to signal that he rejects evil entirely, and then the Emperor starts attacking Luke. This rallies Darth Vader, and he ends up killing the Emperor. However, in doing so, he uses up his last ounce of strength. He takes off his mask, thus essentially denouncing the evil role he had decided to play in life, and he and Luke have a reconciliation. His father passes away having been saved spiritually by Luke’s overwhelming dedication to the light side of the Force. Luke returns to help celebrate, and he reconciles with his friend Han Solo and his sister. The spirits of Obi Wan Kenobi, Yoda, and Luke’s redeemed father appear reminding him of the victory that he has won. That is the end of the third movie. In this case, the “boon” or “gift” he receives is knowing that he has saved his sister, and allowing her to pursue a romantic relationship with his best friend Hans Solo. This is a typical Hero’s Journey and one of the reasons why the first triilogy (the less said about the second trilogy, the better) of Star Wars resonated with a generation of young people is because it told the timeless tale of that Hero’s Journey in a new, modern guise of science fiction and fantasy which George Lucas rightfully thought would appeal to that generation. Although my politics are very different than Ronald Reagan’s, I did come away from Rick Perlstein’s biography with an admiration for how he rewrote the script of his life, by making himself its centerpiece and hero rather than just a sullen observer from the sidelines. He did it by imbibing the hero myths embedded in the stories he read in the library, but then he made the leap by deciding to become the hero himself. So how do you become a myth-maker? Here’s some ways to take the hero’s journey. What do you do when you play? What do you think about when you are by yourself and day dreaming? Find out what type of books you like to read for fun, and among those books, which protagonists are the ones you identify most with. What do you dream about? What kind of plots are there, and if there are larger dreams that have a plot, what kind of obstacles or challenges do you face? This method of inspecting the contents of your conscious mind when you are playful, or when you are unconscious and REALLY playful, is a good way to connect with what your passion is. A few years back, I found myself, like many others in my company, suddenly told we were no longer working there. I tried to go back to the same type of job for another company, but I found obstacle after obstacle where I had never found any in similar searches in the past. I realized I was going to have change direction, but … what direction? What new career should I embark upon in the middle of my life? Toastmasters helped me change the narrative of my life, in a way similar to how Ronald Reagan changed his life by changing the narrative of it. Now rather than focusing on the past and what society liked labeling as “failures”, I was now focusing on the successes I was having in the present, and extending that in my imagination to future successes I would continue to have. I went through a period of introspection where I networked and asked others about what direction I should take, and I ran into someone who convinced me to look into project management because my work experience and my interests, she said, would make me a great project manager. I took an introductory class at a community college and was fascinated. This is really interesting, I thought. Then I took a course on Microsoft Project to learn one of the tools of the new career I was contemplating. I took to it like the proverbial duck to water. Maybe this is for me, after all! So I took a course that helped me prepare for certification as a project manager. I took the class and passed! But rather than resting on my laurels, I decided to volunteer and help put on the course the next time it was held. As I did this, I started to help the next class of students study for the exam, and so I started my blog (the one you are reading now) where I would put the study group notes for the students to read between classes. When the project manager putting on the class quit, I ended up being the project manager and put on three additional classes, and I also got project management experience by helping organize a job search seminar for project managers who were looking for work (like me). At that time, I was called back to Chicago by my father who was having health difficulties. When he had improved, I made the choice to stay here rather than going back to California, because I was starting to really connect to the community through my joining a local Toastmasters club. I joined a church, and felt comfortable there as well. And finally, I got project management experience again by being the project manager for one of the tracks of programming at the Professional Development Day event in 2013 put on by the local Chicagoland chapter of the Project Management Institute. This lead, in turn, to my being named the Chief Project Manager for the entire event this year. And then, in July, I was chosen to be the Director of Certification for the Chicagoland chapter because of my experience helping run the PMP/CAPM certification exam prep class. All of these experiences happened because I decided to leave the known and enter the “unknown”, in this case, a whole new career in the middle of my life. But when I started taking that journey, people and experiences that helped me a long the way started to appear, and I am passionate about my career for the first time in a long, long time. That passion makes me constantly look for ways to improve my knowledge base about project management, and to pass such knowledge along to others in the form of this blog. Since others helped me along the way, it is natural for me to want to help others who are taking that journey as well. One of the most satisfying things I do is to take phone calls as the Director of Certification from people who are wondering about the profession, or who are wondering how to further their profession through certification. I want to help other’s take the Hero’s Journey as well! That is why I look forward to 2015, as a way to go further on the adventure. When you come to your profession as a calling rather than just a job, then you know you have made the right choice! The idea for this post came to me from the series of workshops called Sacred Communication run by Rev. Henrietta Byrd at our Unitarian Church, and which I have been going to for a little over a year. The starting point for these workshops is the Golden Rule: do unto others as you would have others do unto you. If you are coming from a Western religious tradition, you do this because the other is as much of a creation of God as you are. If you are coming from an Eastern religious tradition, you do this because the other contains as much of a divine spark of God as you do. In either case, no matter what side of the religious and/or mythological divide you find yourself on, the ethical endpoint should be the same. But in Rev. Byrd’s Sacred Communication class, we turned the Golden Rule inside out, meaning that you need to treat yourself in the same way as you are supposed to treat others: with a combination of compassion or tough love, as appropriate. One way of starting to go about doing this is to ask yourself the important question: what is that bothers you the most? In other words, what are your pet peeves? This should be something more like a character trait, and not some trivial thing insisting on the correct way to pronounce the name “Goethe”, for example. When doing this exercise, most everybody picks something about other people that they don’t like. Rev. Byrd pointed out two things after it was done. First of all, she didn’t say she wanted people to pick something out about other people that bothered them; she just asked for people to pick something out that bothers them period. Usually people pick characteristics of other people, and not their own foibles. However, here’s where things got interesting. Most people when they analyzed what bothered them about other people found that the source of the annoyance wasn’t in the other, but in one’s self. Often times, we don’t recognize something in ourselves for whatever reason, and we project this onto others. This is called the “shadow”, and must be confronted if we are to have authentic communication with ourselves, which includes having communication with our unconscious. Normally when we think of the unconscious we think of the primitive parts of the mind that come out during dreams. This is partially true, but the unconscious can be something that is potentially within our conscious awareness that we have simply refused to consciously recognize. This process starts early, as in the following example from the talk The Neurobiology of Shadow done by Dr. Keith Witt in the The Shrink and the Pundit segment on Jeff Salzman’s “The Daily Evolver” website. Shame is an emotion which everyone thinks of as negative, but it actually has an evolutionary purpose. Let’s say a toddler is in the kitchen and is about to do something dangerous, like stick a fork in a toaster or light socket. The mother is, say, on the other side of the room. What does she do to stop the child? She says “NO!” in a voice which is abnormally loud and usually abnormally low in the vocal register. This creates a negative wave of energy that hits the child and temporarily stuns it, which accomplishes the task of stopping the child from doing the deed which could be a danger. How does the child process this? The emotion of “shame” comes up as the child perceives itself temporarily cut off from the normal flow of the mother’s affections. Being cutoff from this wellspring of loving attention is difficult for the child, and even frightening. Now once the child stops the behavior, the mother may come over and reassure the child that everything’s okay, but that the child must not do that dangerous thing again. However, let’s say the child is angry for the mother cutting off its supply of emotional nourishment, so to speak, but rather than getting angry at the mother, which may not be perceived as being “within the rulebook” of toddler behavior, the child may displace this anger, and project it on the mother. Mother is angry at me, the child may think, rather than at the behavior it has just shown. This shows how the “shadow” begins, because the child is unable to face up to its own anger at his or her mother, which is not allowed. In any case, by the time one is adult, the shadow has a lot of power, and it is the job of psychoanalysis to help reduce the shadow’s power by allowing the conscious mind to recognize more and more that the shadow is really oneself, hence the psychoanalytical saying, “where it is, there I shall be”. In the original German, what we call the ego is the “I” and what we call the Id is the “it”. In translating the German terms to English, the Latin terms for “I” and “it” were used, causing the concept to seem more scientific and less intuitive than the original German terms are. But the process of psychoanalysis is basically that of “redeeming the shadow” by showing what you have originally labeled to be “out there” in the third person as an “it” is really something within you, that is therefore really in the first person as an “I”. The process in Integral Theory of recognizing one’s shadow through dream work, or by Rev. Byrd’s method, by seeing what bothers you or excites you out there in the world, is sometimes called the “3-2-1 Process”. You recognize a simple or a person that bothers you, and you describe in the 3rd person. Then you go to the 2nd person, and you have an imaginary conversation with that person or thing. Then you finally go to the 1st person, and imagine that person or thing having a conversation with you, but this time you take the part of the ostensible “other”. It is very powerful, and yields tremendous insights. And this is part of the power of the Sacred Communication workshops, in that we learn to deal with what bothers us in ourselves. Of course, when you recognize what bothers you, what do you do about it? You use creative visualization to create a new reality where you are now different. For example, last year I came to Chicago looking for a new position in my newly chosen career as a project manager. I was looking to be hired, so I was looking for leaders or bosses to whom I could act as a helper or assistant. Henrietta said no, you have to see yourself as the boss. What she meant was that I had to see myself as the boss or CEO of my own life, of my own career. I had to take charge. With that attitude, I was to walk into meetings and do activities with the idea that, rather than following a leader, that I would be a leader that others would follow. In the course of about six months, I found this turnaround in my psychological narrative started to bear fruit. I had three leadership opportunities come my way: 1) at church, I was made a member of the Board of Directors, 2) at Toastmasters, I was made an Area Governor, and 3) at the Project Management Institute, I was a made a Chief Project Manager for their main professional development event called Professional Development Day, AND I was made the Director of Certification for all of their certification programs. It showed that the way I communicated with myself had an effect on how others perceived me, and my reality changed accordingly. This is why when you want to change the world, start by changing your way of addressing the world by seeing it as a challenge rather than a battle, but then change your way of addressing yourself. Rather than drawing closer to others by helping them fight their battles, see yourself as a leader rather a soldier, and you will start to draw others towards you! When I try to deal with people in the various groups I am a leader of, I realize that I have to adjust my attitude sometimes when I deal with certain people in order to be able to relate to what their feelings are. But even more importantly, I have to adjust my altitude as well. What do I mean by “altitude”? I mean what level on the spiral dynamics developed by Don Beck and Chris Cowan in their 1996 book by the same name, and subsequently adapted by Ken Wilber as part of his Integral Theory model as the stages of development. These levels of spiral dynamics refer to core value systems which people adapt as they go from stage to stage. It is similar to Maslow’s hierarchy of needs, in that people start at the bottom of the spiral and progress to the next stage only after they have fulfilled the current when they are in. It is different in that Maslow’s hierarchy refers to psychological needs, but spiral dynamics refers to both psychological and social value systems, covering the subjective and intersubjective (“cultural”) quadrants in the Integral Theory model. Let’s just take an example: not all conservatives are created alike. When I am talking to someone who is a fiscal conservative, I am usually dealing with someone at the Orange level; when I am talking to someone who is a foreign policy conservative, I am usually dealing with someone at the Blue level, and when I am talking to someone who is a social conservative, they are often at the Red level. So when I am discussing an issue with them, I have to use the language of the level they are at in order to get through to them. If I am trying to talk to them about the issue of “fracking” for example, someone at the Red level will want to know how it fits in with their traditional, usually religious, values. Someone at the Blue level will want to know how it fits in with the idea of national security and our country’s place in the world, whereas someone at the Orange level will want to know if it profitable or not. Someone coming from the Green level who is concerned about how fracking will affect the environment will not get far talking to any of these other three levels just by advancing the value system that includes the environment as opposed to the economy, the country, or one’s religion. Of course, a society in the aggregate can be at a certain “center of gravity” that can be approximated by one of these memes. When the United States decided to invade Iraq, which was at the Red level of value development because of Saddam Hussein ruling as a dictator, the naive idea was to bring democracy to the region, which would be the equivalent of bringing it to at least the level of Orange, the level achieved by the United States at its founding, an evolutionary leap above the Blue levels of the nation states of Europe. However, rather than bringing Iraq up closer to its own level, the United States merely removed a dictator, and allowed the sectarian strife between the Sunnis and Shias, which had been suppressed by Saddam Hussein, to erupt and now the region is reduced to the Purple level of a conflict between clans. Whether you are a person or a society, you cannot just magically leap from stage to stage; the evolutionary process requires the structure at each level to be complete before you can go to the next one. Although the memes appear to have different themes, the reason why it is called a spiral is because each meme has an emphasis on the individual or the group. For example, the Orange meme is very individualistic whereas the Green meme favors the formation of a group or collective. Ayn Rand, for example, is a quintessentially Orange-level philosopher, and she sees any expression of a group or collective (what she would call “socialism”) as an anathema. And this gets me to the feature that all the six memes have in common: they all agree that the real problem in the world is all of the other memes, and they have a conviction that the world would be simpler if the other memes didn’t exist. One simple way to describe the first-tier memes is that they are a fear operating system, with fear or even hatred of the other memes as a common thread. The second-tier memes are inhabited by those that understand that they are the culmination of a spiral, meaning that the meme they are in has been achieved only by going through an evolutionary process involving all the previous memes at the first-tier level. Seen in this new light, the first-tier memes are not to be feared, but to be loved, because they represent where the person used to be earlier in their evolution. And in certain situations, those first-tier memes are still valid. Here are the two second-tier memes, the first one being the individualistic version, and the second one the communal version. I identify myself as being at the Yellow meme, trying to achieve the Turquoise stage by linking up with others who are at the second-tier level. My conviction is that anybody who is a leader is going to be more effective if they are dealing from the second-tier level because they will relate to anybody else on the spiral, whereas those who deal from the first-tier level will identify those at a different level as a potential enemy, rather than a potential ally. ; And that is how you make the world a better place is by stooping to conquer, to borrow a phrase from the Oliver Goldsmith classic. The four modules of Integral Life Practice are: Body, Mind, Spirit, and … Shadow. Most people are familiar with practices that strengthen one’s body (strength training), mind (language study), and spirit (meditation), but what is shadow? Shadow is an aspect of ourselves which we have denied or rejected, and thus project onto others. Since it is therefore an unconscious drive or need, how do we make it conscious? There are two ways to do this, one of which is dream analysis, using a technique called “gestalt”, where you take something that scares you in a dream, and 1) observe it, then 2) have a conversation with it, and finally 3) describe the dream from the first-person standpoint of that which scares you. Another way to become aware of shadow, is to describe someone who “rubs you the wrong way”, someone whom you have an emotional reaction to which seems a little exaggerated or over the top. Then observe that person and their characteristics, have an imaginary conversation with that person, and then join the conversation by taking a first-person perspective of that person talking back to you. This is referred as the 3-2-1 process, because you are relating to the shadow figure in the third person, then in the second person, and finally in the first person. The reason why this is important is because what bothers you about others is many times what bothers you about yourself which you fail to recognize. In analyzing these dreams according to the gestalt procedure outlined above, I found out what was happening. I associated the military with discipline, and somehow I had a self-image that refused to believe that I was disciplined. This was because my older brother and I had almost defined ourselves in terms of each other, and I saw him as the disciplined one, and he saw me as the undisciplined one. This may have been true in relative terms when we were in high school and college, but in reality I was very disciplined, at least in the areas I cared about, like language study. So the positive quality of being disciplined was something I refused to recognize in myself, so the dream was saying “you are disciplined after all.” That was what was meant by my being drafted in the military and my reconciling myself to that reality despite my initial objections. You can only kill the beast by recognizing that you yourself are the beast. So come out of the shadow, and recognize that the reality you face is always less scary than the one you run away from. Tonight is Christmas night, and one of my favorite Christmas carols is “Do You Hear What I Hear?” I learned at a Unitarian Christmas Eve service that the carol has a surprising history: it was written as a plea for peace during the Cuban Missile Crisis which took place in October 1962. There were two weeks in October 1962 when the Cold War between the United States and Soviet Union was in danger of becoming a very hot war indeed. You see, we almost had a nuclear war during the Cuban Missile Crisis. At that time, John F. Kennedy was the president of the United States and Nikita Khrushchev was the Premier of the Soviet Union. The United States had deployed nuclear missiles in Turkey that were capable of reaching Moscow, and so in a sort of global chess game, Khrushchev conceived of a plan to counter this by deploying nuclear missiles in Cuba that could be pointed towards the U.S.
On October 14th, 1962, their plans were found out. A US spy plane on a reconnaissance mission over Cuba took pictures of seemed to be a missile base construction site. The CIA analyzed the photographs identified the objects as being medium-range ballistic missiles. These were the rockets that would carry nuclear warheads to their targets in the U.S., but they did not see any warheads themselves. So they assumed that the warheads had not yet been delivered, and that the Soviet Union would soon be sending ships to deliver them to Cuba. The President was informed of the existence of the missiles in Cuba and he held a meeting with members of the National Security Council, and the Joint Chiefs of Staff of the U.S. military. There were three options discussed, diplomacy, a limited blockade to prevent the warheads from reaching Cuba, and a full-scale invasion. The Joint Chiefs of Staff unanimously agreed that the only option to remove the threat was a full-scale attack and invasion. They figured that since the nuclear warheads were not yet in Cuba, the Soviets would not be able to stop the U.S. The National Security Council preferred the blockade option, which Kennedy accepted, but the military was directed to prepared for the full invasion just in case. Meanwhile, on a beach in Miami, Florida there was a little boy who was playing with his grandfather. He and his mother had flown from Chicago to spend a vacation there. That night they saw President Kennedy on the television who announced that Cuba had missiles aimed at the U.S. and that the U.S. would launch a blockade around Cuba. The Soviet Union now gave its response, saying that it would view a blockade as an act of aggression and that their ships would defy the blockade. The situation was now at a stalemate; the U.S. raised its defense level to condition red. There is only condition beyond this, condition white, which just happens to be the color of the center of a nuclear explosion. That night, the boy who staying with his grandfather heard the voice of his father on the telephone calling to tell him that he loved him very much. You see, the father was a reporter who knew the seriousness of the situation, and knew that his son was in a place that would very likely be a target of a nuclear attack in the case that war broke out. He wanted to memorize the sound of his son’s voice in case he never heard it again. At 6:00 PM on the night of October 26th, the State Department received by teletype a very long and emotional letter written by Khrushchev . Tommy Thompson from the State Department, a former ambassador to the Soviet Union, was sitting at the elbow of the President reading what he referred to as the soft, diplomatic message which he said had come directly from Khrushchev. Just then, another message that came in that was more threatening and it was the message that had written by the hardliners in the Kremlin. The crucial question now was: which message should the U.S. respond to, the soft message or the hard message? Tommy Thompson had knowledge of the Russian language, but even more importantly, because of his time as ambassador to the Soviet Union, he knew the Premier personally. He could empathize with him, and knew exactly what the Premier was thinking. He said that the Premier was being pushed by his hardliners into a military confrontation and he wanted desperately to find a diplomatic solution that would allow him to save not only the Cuban people from invasion, but to help him save face politically. President Kennedy finally understood exactly how the Premier felt. President Kennedy listened to Tommy Thompson, and made a deal with the Soviet Union. You pull out the missiles from Cuba, and we will remove ours from Turkey. Khrushchev agreed, and the crisis was now over. In 1992, it was discovered that the CIA had made a mistake. Remember how they had assumed there were no warheads in Cuba? There were over 160 nuclear warheads already in Cuba. So the blockade accomplished nothing. But more importantly, if Kennedy had listened to the military, who based their strategic plans on what the CIA had told them, the invasion would have failed and nuclear war would have resulted. And I would not be standing here today. Why? Because that boy I mentioned in the story–was me. I urge you to see the documentary The Fog of War, the former Secretary of State Robert McNamara listed several lessons to be learned from the Cuban Missile Crisis, among them 1) be prepared to re-examine your reasoning, which you can see by the fact that the CIA made a mistake regarding the warheads, and 2) empathize with your enemy, which was the key to Tommy Thompson’s diplomatic breakthrough. And to that, I would like to add a lesson of my own. We can learn from Tommy Thompson and use the power of language to engage the language of power. And it is the power of language, and its ability to be an window of understanding, and through that window, to be an instrument of peace, that has motivated me throughout my life.